Today, I am reviewing a whisky that I have been overdue in reviewing, Bowmore Legend. This is one of the most reasonably priced single malt Scotches on the market today, especially from Islay. At least up here in Boston, Islay malts have gone through the roof in popularity and price. It is rare to find either Laphroaig or Ardbeg for under $55. However, this no-age-statement Bowmore release is usually priced around $30, making it a quite reasonable purchase. Legend is the first whisky that I’ve reviewed from Bowmore, a distillery located in the middle of the Isle of Islay, across Loch Indaal from Bruichladdich. There is quite a rich history of distilling at Bowmore. For starters, it is the oldest distillery on Islay (est. 1779), as well as being one of the oldest distilleries in Scotland. In the last 20 years or so, Bowmore has become famous for its Black Bowmore line, a series of vintage releases from Oloroso sherry casks. Obviously, these old, sherried whiskies fall well beyond my price range, but I have yet to hear anyone say a marginally bad word about a Black Bowmore. The general consensus among the “experts” is that Bowmore is a spirit best enjoyed with some age and some sherry influence. 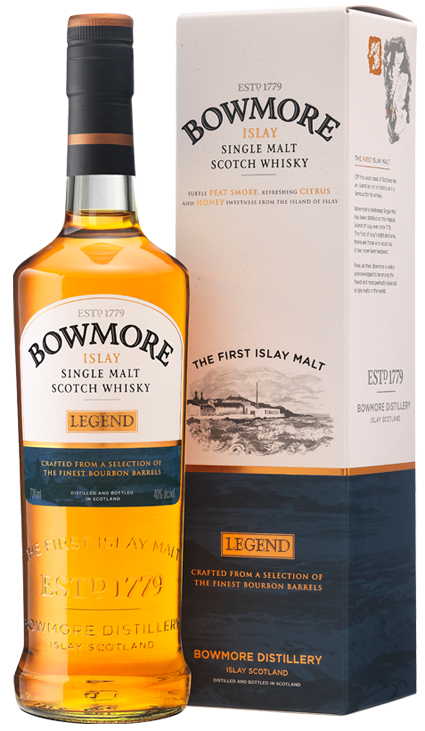 Personally, I have always been a fan of the Bowmore 12 yr., but I have not had it in a while, and would need to refresh my memory in order to do a quality review. I had hoped to grab a bottle of Bowmore 12 when I entered the store last month, but when I saw the Legend on sale, I grabbed this young whisky instead. Legend is bottled at 80 proof (40% abv), and aged exclusively in ex-Bourbon barrels. On the nose, Legend produces some lovely notes of smoked honey barbeque, earthy peat, salted pork, fresh barley, and cooked plastic. Overall, it is a fairly acidic nose, which is a bit off putting. The palate is rather light, but there is a nice blend of sweet honey and malt with smoked meat and peat. The sensation is not all that far from a honey-glazed ham steak. The finish is peaty, with some brine notes, some sweet barley, some salt, and a nice lingering vanilla. In my opinion, water brings the peat to the fore, which dulls down the complexity of this one for me. This is a whisky that pairs most beautifully with something sweet, like chocolate covered almonds or vanilla pudding. I have to admit that it took me a while to warm up to Legend (or maybe the Legend took a while to warm to me). When I first cracked the bottle, I thought the whisky was too acidic, with some raw phenolic, iodine flavors that came off rough, like nail-polish remover. However, halfway through the bottle, the whisky has rounded out nicely into a very solid everyday Islay malt at a great price. My Grade: B-. Price: $30-35/750ml. This is a good, young, medium-bodied Islay whisky that makes for a good pour day to day. I suspect this one would work very well in an Islay-based cocktail as well.